Shooting down drones in the USA has been a thing for a while. Or at least, attempting to. And while there may be circumstances under which civilians are allowed to shoot down privacy-invading drones, the US government wants their chance, too. Congress has now passed the FAA Reauthorization Act, which will allow them to “disrupt”, “exercise control”, or “seize or otherwise confiscate” drones that they perceive to be a “credible threat”. But it is not without objection. If you were hoping to capture some aerial shots at the upcoming NASCAR events, not so fast. DroneShield will cover all the races at Texas Motor Speedway in Fort Worth, and if you try to fly a drone – they will take it down. Earlier this year, we were quite surprised (to say the least) by the information that Dutch police were training eagles to take down drones. And what’s more, it seems that the weird approach against UAVs worked. 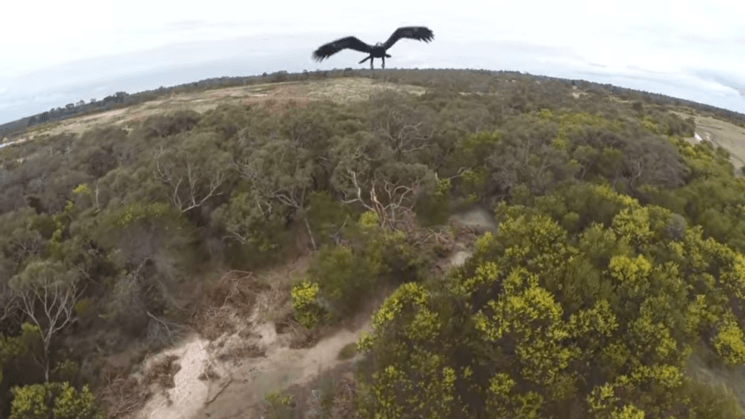 But it appears eagles in Australia require no training to do it. Because they started seeing surveillance drones as their prey, a mining giant Gold Fields has lost nine drones! Irresponsible and ill-intentioned drone operators continue to pose safety and security hazards, and researchers continue to develop inventive ways of taking out the rogue devices. The Drone Catcher is not the first anti-drone solution nor the first anti-drone drone, but it’s definitely the closest one to possessing superhero capabilities. Developed by Michigan Tech’s HIRo Lab (Human-Interactive Robotics), the Drone Catcher fires a net at other drones and catches them mid-air. Battelle recently announced the DroneDefender, an inexpensive, handheld, point-and-shoot system that will prevent the ever-growing number of drones out there from becoming security or safety threats. Using radio control frequency disruption technology, the DroneDefender can disable a potentially dangerous or hostile drone from a distance of up to 400 meters by making it believe it is out of range. This will cause the drone to follow its built-in safety protocol (hover, return home, or slowly descend) and prevent detonation or other remote-controlled functions.